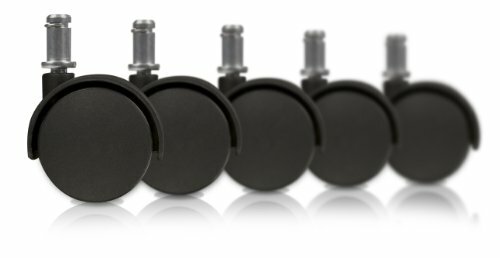 A perfect set of 5, replacement, 2" caster wheels for your office chair. These wheels use a standard 7/16-inch sizing stem that simply snaps in where the old one snaps out, making them ideal as a full replacement set and suitable for almost all office chairs taking only minutes for replacement time. These quiet rolling castor wheels swivel a full 360 degrees easily and smoothly without clunky hang-ups or stuck wheels. Comes with 5 total wheels, 2" diameter twin wheel design - the standard for most office chairs. The flat black finish blends flawlessly with almost any type of chair or decor. Perfect for home office, office, with or without chair mats. If you have any questions about this product by Slipstick, contact us by completing and submitting the form below. If you are looking for a specif part number, please include it with your message.